A few months ago we were delighted to hear from our youngest daughter and her husband that they are expecting their first child next March. As is the trend with today’s parents-to-be, they opted to find out their baby’s gender before birth. Katie had an ultrasound and a blood test done. Though the news was concealed inside an envelope, it was a little too simple to just open it up to know whom they will be welcoming into their family. So, the envelope with the precious information was passed off to a couple with remote acreage. 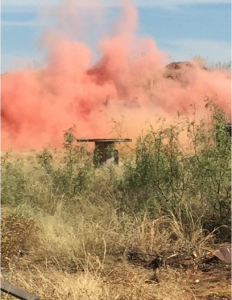 They prepared an elaborate contraption that when hit would explode, shooting the appropriate colored chalk in the air (blue for boy, pink for girl) revealing the gender of the little one Katie is carrying. On the last Saturday of October, we had a celebration brunch with some family and friends and then headed out as a caravan to the said property for the Big Reveal. Chase is licensed and experienced using a rifle, but it took him a couple times to correctly hit the target, which was about one hundred fifty feet away from him and all of us who were cheering him on. Waiting with great anticipation, many of us held cell phones to catch the “big reveal,” making it a bit hard to pay attention to all the details. When the rifle shot finally made contact with the disclosing mechanism, a small puff of grayish smoke appeared above the target site, leaving most of us a bit confused. Some noticed, however, that a pile of pink chalk had spilled out on the ground, causing them to shout, “It’s a girl!” Daddy-to-be wanted to get it right, however, so the property owner fixed the target, and a few minutes later we watched as a huge pink cloud appeared above the site, causing us all to clap and shout for the news that a baby girl would be born. Of course, God needed no advanced procedures or technology to foretell the birth of His Son. The first pronouncement came hundreds of years before Jesus’ birth, as Isaiah states, “For to us a child is born, to us a son is given;” (Isaiah 9:6, ESV). The surrounding passage speaks of a great light shining and exceeding joy for the nation of Israel. Closer to the event, God sent the angel, Gabriel, to Mary to reveal that she was carrying His Son. No ultrasound was needed; no blood test was taken; no shot was fired at a faulty device. The almighty God sent His reliable messenger to the chosen mother to let her know that she would have the promised One, and to inform her, “and you shall call His name Jesus. He will be great and will be called the Son of the Most High. And the Lord God will give to Him the throne of His father David, and He will reign over the house of Jacob forever, and of His kingdom there will be no end.” (Luke 1:31b-33, ESV). Though their conversation was quiet and private, God’s news exploded into the world. There was excitement and celebration when Mary visited her cousin, Elizabeth, and the baby boy she was carrying “leaped for joy.” And Mary glorified the Lord in her celebration of the baby who would be born to her for all mankind. Jesus’ birth happened just as Mary was told. God employed angels once again to make the grand announcement. It was to shepherds in the field that the angel of the Lord appeared. Though the sight caused the shepherds to be afraid, there was no error or doubt regarding the message. “The angel said to them, ‘Fear not, for behold, I bring you good news of great joy that will be for all the people. For unto you is born this day in the city of David, a Savior, who is Christ the Lord. And this will be a sign for you: you will find a baby wrapped in swaddling cloths and lying in a manger.’ And suddenly there was with the angel a multitude of the heavenly host praising God and saying, ‘Glory to God in the highest, and on earth peace among those with whom he is pleased!’” (Luke 2:10b-14, ESV). The shepherds responded by visiting Jesus and then proclaiming what they had been told by the angel. When they left, they too gave praise and glory to God for the baby boy who was born to be the Savior of the world. I didn’t mention before that even with the most sophisticated testing to date, gender predictions can be wrong. But God’s accuracy rate is always 100%. Jesus was in fact born, lived a sinless life on earth for thirty-three years, and then died on a cruel tree to make atonement for the sin-stained world. We can rejoice continually because He was resurrected from the dead, and He lives forever to rule and reign. So let the angels sing and the blue chalk fly! ‘Tis the season to remember and celebrate the Big Reveal: “It’s a Boy!” And, He has been born for you.